A derelict footbridge has been restored at a heritage estate with the help of a 174-year-old sketch. 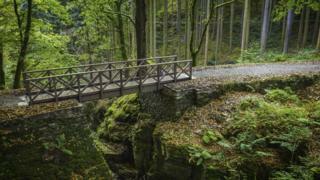 The bridge crosses a gorge at the Hafod Estate near Devil's Bridge, Ceredigion. It collapsed in the 1980s after decades of neglect. The restoration team, backed by a £17,500 grant from historic monuments body Cadw, based the design of the structure on an 1843 sketch of the original bridge. The bridge, which has been designed to accommodate wheelchairs, links two halves of the original carriageway at the 200-hectare estate. David Newnham, project manager at restoration leaders the Hafod Trust, said: "Restoring and maintaining such a large and complex landscape as Hafod is no mean feat. "The bridge's installation will allow visitors to follow in the footsteps of Georgian tourists and enjoy the walk's wooded valleys, rushing streams and waterfalls for generations to come." Economy Secretary Ken Skates said he hopes the investment will "help reignite" the Hafod Estate's reputation as a "world-class historic landscape". "It's crucial that we continue to identify and protect historic environments like this to safeguard Wales's rich heritage for future generations to explore and enjoy," he said.